Giulia Traverso says that finding a female role model in the IT world is invaluable. In this interview Giulia, who is a PhD candidate in cryptography, tells how she found a mentor. That this happened at Ada Lovelace Festival makes the story even better ;-)…. 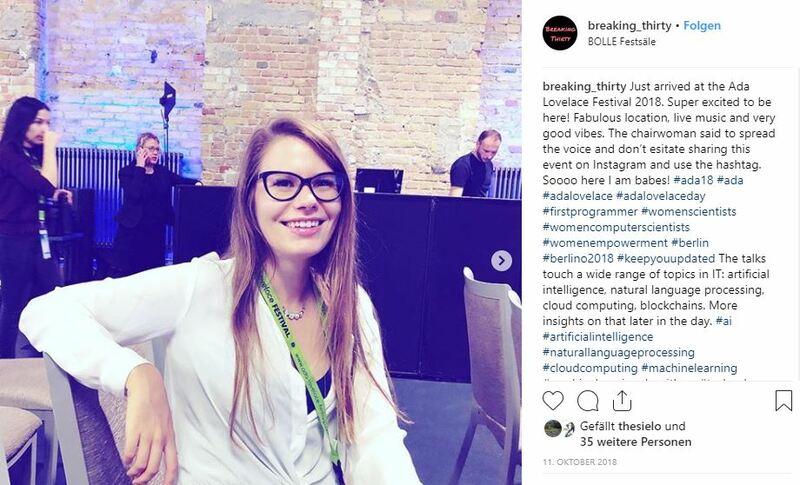 Giulia, I got curious when I saw your Instagram post on how you found a mentor at Ada Lovelace Festival 2018. How did that happen? Giulia Traverso: I went to Ada Lovelace Festival 2018 already hoping to find a mentor or a role model. Being female in the IT world means that there are not many women that can show you what are the possible paths you can take and that can share some insight on how they got there. 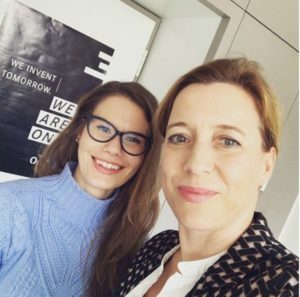 One of the speakers at the Festival was Sabine Scheunert (see her talk and all the other keynotes of #ada18 here), Vice President Digital & IT Sales/Marketing at Mercedes-Benz Cars. She gave an inspiring talk where she encouraged us to take advantage of the bumble-bee effect to accept challenges and confidently get out of our comfort zone. At the end of her talk, she announced a mentorship program. Anyone could apply by sending a mail and answering these three questions: 1) why do you work in IT? 2) what would you like to excerpt from this mentoring program? 3) what is your biggest struggle at work currently? What does this mentorship mean to you? Giulia Traverso: It means a lot. Really. As I was saying earlier, there are not many female role models in the IT world. The opportunity to witness first-hand what it means to be in a leading position of such a huge company with such an influencing brand is invaluable. Seeing Sabine being “in the zone” and 100% present in every meeting room she enters and while having any sort of interaction teaches me a lot about what good leadership really means. She never loses focus and can shift from IT-related matters, to communication and marketing, to management topics while staying on top of the game. If I’ll ever decide to try to pursue a similar career path, now I know exactly the person I’ll have to become. Tell us a little bit about your project Breaking Thirty. What do you do there? You’re doing your PhD in cryptography. What is your current focus in cryptography? And how are you coming along? Giulia Traverso: I’m doing my PhD at TU Darmstadt, one of the most renowned and competitive universities worldwide for computer security. My PhD thesis focuses on long-term security, meaning it investigates how data can be securely stored in an outsourcing scenario for decades. The peculiarity of long-term security is that common encryption schemes must not be used, because that would make the storage prone to advances in cryptanalysis and attacks run on quantum computers. Instead, the cryptographic primitives used provide information-theoretically confidentiality of data. That is, they remain secure regardless of the computational power of the attacker. The type of data that need such stringent confidentiality requirements are sensitive data such as electronic health records. I have just finished my thesis (I’m still happy-dancing on my chair!) and I defend in April. I’m scared and excited at the same time! And last but definitely not least. Do you have plans for after your PhD? Giulia Traverso: I don’t have exactly something concrete in mind right now (I told you, I’m a Breaking Thirty type of gal! ), but I for sure can tell you what I hope for myself. I’d like to have the chance to use the problem-solving and critical-thinking attitudes I developed during my PhD to design more affordable and feasible solutions so that to bridge the gap between theory and practice in cryptography and IT. I want to be more of service and less of an ivory tower-scientist.